Louisiana Cajun supergroup Bonsoir Catin have always been ground-breaking Cajun artists. With one foot in the old traditions and the other in thoroughly modern sounds, their new album, L’Aurore, is one of their strongest statements yet. On the surface, Bonsoir Catin may look like a traditional Cajun band, and their music features brilliant instrumental work from Kristi Guillory’s accordion and Aya Burgess’ fiddle, but the songs here touch on much deeper themes and push beyond the “tears-in-your-beer” standard tropes of Cajun French songwriting. Guillory in particular is an inventive songwriter (nine of the songs on the album are hers), able to draw from the eerie, supernatural elements of the oldest Cajun a cappella ballads, but also able to write songs that would be at home on country radio today, Newer members to the band bring new ideas as well. Electric guitarist Maegan Berard, daughter of the late, revered accordionist Al Berard, isn’t afraid to cut into a Jimmy Page-inspired solo, and bassist Ashley Hayes Steel has way more funk in her bass playing than you may expect. Bonsoir Catin’s album is bursting with new ideas, touching on soul, funk, R&B, and even prog rock influences. It’s a striking album, made all the more powerful for the knowledge and respect these artists have for the Cajun tradition. The first album from renowned indie label Yep Roc’s new partnership with UNC’s Southern Folklife Collection, Swampland Jewels brings together a wide selection of remastered and remixed releases from the Eddie Shuler’s famed Goldband record label in Louisiana. In the 1940s, 50s, and 60s, Shuler proved himself time and again as a discovery point for some of the greatest names in Cajun and Creole music. Interestingly, this collection has no selections from Shuler’s greatest hit machine: the Cajun accordionist Iry LeJeune. LeJeune helped spark the first Cajun roots revival with his incendiary playing and his covers and reworkings of black Creole artist Amédé Ardoin’s classic 78s. In a sense, it’s nice not to have him on Swampland Jewels; for one thing, most of his material is readily available today, and for another it allows the album’s compilers a chance to focus on Shuler’s other musical “discoveries.” Shuler had a nose for finding music that would sell to the Louisiana communities and beyond, and found himself at the locus point for at least three musical revolutions: the Cajun accordion revival (Iry LeJeune), the Creole creation of Zydeco (Boozoo Chavis) and the coming of swamp pop. Most of this took place in the 50s, and, as I recall, Shuler was mainly responsible for what would have been the first actual Zydeco recording: 1954’s “Paper in my Shoe” from Boozoo Chavis. The story behind the recording of this song, which I think predates Clifton Chenier’s Zydeco recordings by a year (Chenier is generally considered the father of Zydeco), is completely fascinating and covered at length in THIS blog post and in Michael Tisserand’s excellent book, The Kingdom of Zydeco. The story shows Shuler to be a difficult character to work with, and it’s true that he’s certainly a controversial figure in the history of Cajun and Creole music. Tisserand reports that Shuler shared songwriting credits on many early recordings of this music, despite openly admitting that he didn’t speak Cajun or Creole French. And Shuler’s treatment of Chavis, though clearly complex, was responsible for Chavis’ rapid retreat from the music industry, thus costing us decades of powerful work from one of the progenitors of the tradition. Aside from this, Swampland Jewels presents a period of time when rock n roll, old Acadian traditions, rough-and-tumble country, and black rhythm & blues came crashing together. The music is raw, brutal, and undeniably exciting. You can hear musicians taking wild chances in these recordings, and though not everything worked, it’s undeniable that this period of gestation still defines Louisiana music today. Kyle Huval and the Dixie Club Ramblers. Straight Allons. The sheer power of the little one-row accordions in Cajun dancehall music can bring to mind the blasts of a New Orleans brass band, but the Cajun prairie music of Lafayette, Louisiana is meant more for crowded dances than for parades, and the accordion leads this rowdy French-language country music. 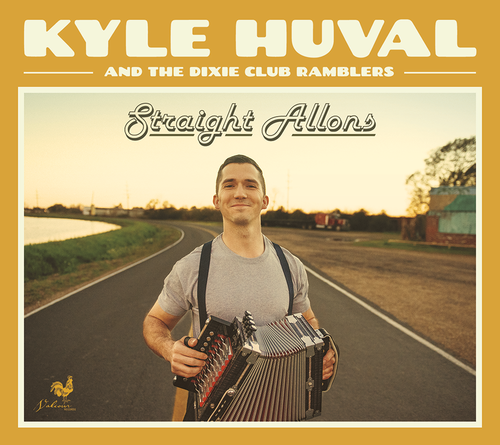 With the first explosive blasts of the accordion to open the song “Loin de Moi,” young singer and accordionist Kyle Huval marks himself as a major player on the scene. He’s a songwriter too, which is increasingly rare in Cajun music, but Huval’s songs are written in the drawl of the Cajun French dialect and rooted in the sad, lonesome songs of Texas and Louisiana that first made Cajun music cross over to country success. In fact, one of the album’s highlights is a Cajunized version of Jim Croce’s classic “Don’t Mess Around With Jim,” so Huval’s country roots are strong indeed. With his trademark suspenders and beaming smile, Huval’s like a reincarnated Iry Lejeune, a bold new voice that’s making sure the music stays true to its roots in the packed dancehalls of Louisiana’s Cajun Country. Various Artists. Cajun Accordion Kings (and The Queen). A brilliant little album, this collection of modern “field recordings” was made à la maison by Cajun fiddler Joel Savoy and it’s almost his ode to the great accordionists that have inspired him. Created to accompany a show of Cajun accordion heroes at the Liberty Theatre in Eunice, Louisiana, Savoy jumped at the chance to get these players in front of mics to pick up the sound of their solo accordion playing. That’s right, there are no other instruments here, just the one-row Cajun accordion that’s such a hallmark of this music. And how that accordion shines! You can hear the octave jumps, the triplets, the raw bounce of the instrument, even the clack of the buttons as the players press down the notes. Each person here is an avowed master, and some are rarely heard on recordings these days, like Walter Mouton, the legendary king of Louisiana dancehall accordion, or the visionary accordionist Jason Frey, who hasn’t recorded in some years. Wayne Toups, Steve Riley, and Jo-El Sonnier are basically grandmasters, and Jesse Lege is a link to the almost-lost past of Cajun music, having grown up with French as his first language. The Queen of Cajun accordion, Sheryl Cormier, brings a spirited waltz, and Dirk Powell, now known for his work with Joan Baez and Rhiannon Giddens, closes out the album. It’s a love letter to the most humble of instruments, and it’s album that accordion fans and fans of Cajun music are sure to love. I remember interviewing Louis Michot, leader of the Lost Bayou Ramblers, some years ago at the Pickathon Festival outside Portland, Oregon. He was there with Gordan Gano of the Violent Femmes, and I kept trying to push him to talk about all the punk influences in the Lost Bayou Ramblers’ unique take on Cajun music. But he wouldn’t bite! He insisted, softly but firmly, that this was his music, that he played it just as he heard it, and that the band was focused only on playing Cajun music. And he was right! This is Cajun music, no doubt, and if the Lost Bayou Ramblers choose to run the vocals through a buzzed out amplifier or choose to squeeze the accordion into a much crunchier punk place than usual, that’s because that’s the way they hear the music. They’ve paid their dues too. The new album, Kalenda, seems a bit less adventurous than their previous Mammoth Waltz, but maybe that’s because they seem to be going deeper into the tradition. Anchored by the pan-Louisianan song “Kalenda”, or “Colinda,” the group explores not only the roots of the tradition, but seem to be as happy as ever trying out new sounds and ideas to push the tradition further. “Freetown Crawl” is almost like a field recording of a Cajun conversation, but matched with weird beats and psych’d-out background vocals. "Kalenda" itself is one of the few renditions I've heard of a Cajun song that really earned the title "swampy." You can hear the swamp critters in the background and there's something about the droning beat that harkens back to Louisiana's voodoo background. The Lost Bayou Ramblers are nothing if not wildly eclectic, and even when the new album veers into tiki-Hawaiiana at the end, there's still a powerful vision tying all this together.